This past fall, Mrs. Minnepop and I finished watching The United States of Tara, which is (for those of you living a fruitful life, free from TV addiction) a Showtime series created by former City Pages’ blogger Diablo Cody that follows the story of Tara Gregson, a middle-aged mother of two, who has Dissociative Identity Disorder (D.I.D). The crux of the show is whether Tara’s condition is a good influence or an anchor to her children and husband—a question that was never decisively answered. When Mrs. Minnepop and I reached the end of The United States of Tara, it felt like there was a massive void in my life. Through watching Tara’s story unfold, I’d become (at least, in my own, easily convinced, mind) an expert on D.I.D. It didn’t seem fair that, suddenly, my use for this knowledge was gone. Luckily, the T-Wolves’ season started in December, bringing with it the triumphant return of Michael Beasley to my television set. For those of you who haven’t had the pleasure of watching the highs and lows of Mr. Beasley (or as Mrs. Minnepop calls him, Ron Weasley) on a nightly basis, I should tell you that he is, perhaps, the most fascinating player in the NBA. Beasley is an incredibly talented scorer, with a soft shooting touch, silky smooth post moves, and explosive ups. He is both strong enough to play the power forward spot and quick enough to play small forward. He shoots left-handed, but is ambidextrous. In his freshman (and only) year of college at Kansas State, he averaged 26.2 ppg and 12.4 rpg, tallied 866 points (second among Freshman in NCAA history), led the nation in double-doubles, and once had this to say about an upcoming game with rival Kansas, “We're going to beat Kansas at home. We're going to beat them in their house. We're going to beat them in Africa. Wherever we play, we're going to beat them.” Then he backed up his bold words by leading K-State to the school’s first victory over Kansas in Manhattan (Kansas) since 1983. Michael Beasley is also crazy, or as better-paid, ESPN-types like to say, “a seriously troubled young man.” After leaving Kansas State, he was widely hailed as being the 2nd most talented player in the 2008 draft behind Derrick Rose. Still, Miami’s G.M Pat Riley, who had the 2nd pick in the draft, seemed reluctant to pick him and the rumor mills bustled with stories about Beasley’s, shall we say, extracurricular activities. Riley did, ultimately, select Beasley with the 2nd pick in the 2008 draft (in retrospect, a remarkably shortsighted choice as Russell Westbrook and Kevin Love were both still available). And then the trouble began. During the NBA’s Rookie Transition Program (which is intended to teach young men, who are about to become millionaires, how to avoid becoming Antoine Walker), Beasley along with fellow rookies, Mario Chalmers and Darrell Arthur set off a fire alarm at 2 A.M. in their hotel room. When police responded to the alarm, they reported that the room smelled strongly of marijuana, but none was found and no charges were filed. Chalmers and Arthur were immediately punished for their actions, but for a while Beasley managed to escape blame. Why? Because he’d pulled a tried and true college trick: before the cops came, he slipped out of the room leaving his pals to take the heat. He only came clean about his involvement when Pat Riley forced him to confess. Okay, so that was strike one. Not too big of a deal, right? Beasley was only 19 years old at the time. We can understand that. Then this happened (kudos to Wikipedia): “On August 24, 2009, Beasley reportedly checked into a Houston rehab center, just days after he posted pictures of himself on his Twitter page with what some have speculated to be marijuana in the background. It is unknown if the rehab was drug related; as a report states, he was receiving counseling for stress-related issues.” SURE. Miami and Pat Riley, wanted nothing more to do with him, and in 2010 they traded him to Minnesota for two second round draft picks (this was also done so that they could clear room for Lebron James and Chris Bosh). Beasley’s time in Minnesota has been relatively calm save for an incident last June, when he was pulled over in Minnetonka (the Minneapolis suburb for the rich and famous) for speeding. The police officer smelled marijuana in Beasley’s car and found a baggie under the front passenger seat. Of course, Beasley claimed the bag wasn’t his, but instead belonged to a friend who he’d just dropped off. RIGHT, BECAUSE THAT MAKES SENSE. I don’t really care much about Beasley’s “trouble.” He’s a young man who has on occasion made questionable choices. That same sentence could describe almost every young man I’ve ever known. What I do care about is Beasley’s basketball game. The problem is that the same highs (literally) and lows that seem to dominate his personal life, also exist in his game. Take a look at his 2011-12 stats (I know, please Alex, more stats, exciting stuff, yes!!!). Scored 27 points in the T-Wolves win over the Clippers. Scored 3 points in their loss to Phoenix. His teammates seem to enjoy playing with him. Opponents seem to enjoy playing against him. He can shoot from anywhere. He always shoots from anywhere. He can keep the T-Wolves in games when the starters struggle. He can’t be trusted to play pivotal moments of close games. The other coach can never predict what he’s going to do. His coach can never predict what he’s going to do. 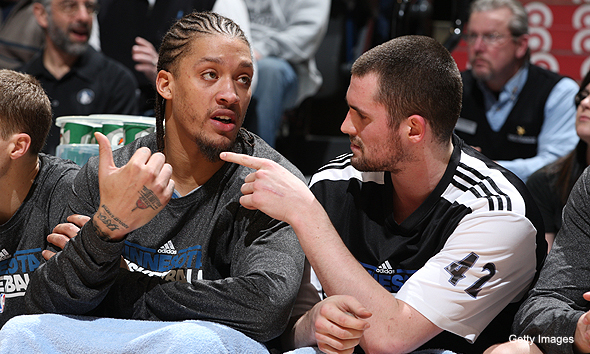 Due to his up and down game, Beasley’s name has been widely referenced in trade rumors. By the time the trade deadline comes on March 15th, at 3 P.M. ET, he is by far, the most likely Minnesota player to be moved. Unfortunately, the returns reflect his inconsistency. Last week, ESPN’s Chris Broussard reported that the T-Wolves offered to trade him to the Lakers in exchange for a first-round draft pick (late, late first round), and Twitter was abuzz with rumors of the T-wolves sending him to the Celtics in exchange for Jermaine O’Neal. Personally, I hope the T-Wolves decide to hold onto him. Michael Beasley might be crazy, but he’s my kind of crazy. More than that, he’s still very young. The T-Wolves (despite my nightly prayers) are not going to win the NBA title this year. In fact, just by making the playoffs they will exceed most of the expert predictions (but not mine!). There is still a chance that Beasley will figure out how to be a consistent player. If he ever does, he is exactly the type of player the T-Wolves need to complement the vast array of skills that Kevin Love and Ricky Rubio bring to the team. Why delete my comments? I never swear, they are always constructive, and I am indeed the only person commenting in the first place. Censorship on a blog is fairly ridiculous anyway. Whats the matter, can't take the heat? Glad to clarify. If they were constructive regarding Alex, I would leave them for sure. But a comment like "zzzz" or "this was bad" as I have seen in the past will equal an automatic delete. Explain your qualm with Theoharides and I am more than happy to leave it for discussion. Comments that make your reaction seem like a pre-informed bias will not stay. Finally, I know I am overly critical and somewhat curt and I am sorry for that. Therefore, this will likely be my last post. I wish to offend no one...I am just offering my lowly opinion. I appreciate that response. You can be overly critical if you want, I just wanted to expand on why I deleted it. Alex is a friend of mine and I want there to be sports writing on this blog. He's in a position of being a huge NBA fan, an aspiring writer and living in Minneapolis while the T-Wolves are capturing people's imaginations as a young team. I encourage his writing as well as the chance to diversify content and base audience. I like it because it's his experience of it and I think it reads well. You can feel free to comment and I'll let more of them fly. I appreciate this kind of feedback, though and I hope you will keep reading and commenting, even if you do choose eschew any of Alex's posts in the future. Ok, that was an exceptionally good response. Rock on Puddlers.